In addition to all my writing, I've also hopped on a few sports podcasts as a guest to offer my insights on Wild hockey, Twins baseball and even some auto racing hot takes. I first got my feet wet with the Wild Xtra team with the 5 Minute Major and Giles & the Goalie podcasts. ​A couple of those guys started their own MN Sports Fans Unfiltered podcast via the Talk North Podcast Network, a network run by the Star Tribune's Jim Souhan. If you're looking for some good sports-fan thoughts, please subscribe or check out their podcasts. As I got established with Cold Omaha/Zone Coverage, I started joining in on the Cold Omaha Staff Podcast typically done weekly. Be sure to check out my Cold Omaha/Zone Coverage Podcast page as well. Just after I joined the Wild Xtra team, some of the guys had me on their 5MM podcast. We talked about the Wild, of course, but that was after they asked me about my favorite beverage. Not a question I expected right off the bat. From the website: Giles and Ben are joined by fellow Wild Xtra writer and journalist extraordinare Heather Rule. Heather is a little quite on the mic, but you can still hear her opinions when the guys shut their yapping. From the website: First, new Wild Xtra writer Heather Rule joins us to talk about how frustrating the Wild are, and how stupid the NHL All Star Game format is this year. My debut on this new podcast, hosted by my Minnesota Wild friends Lonnie and Nick. This one was a live recording at the downtown Minneapolis bar, City Works. I joined my friend Nick as a guest co-host for this MN Sports Fans Unfiltered show. 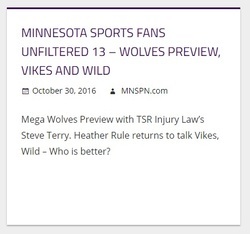 We interviewed guest Steve Terry to talk about a Minnesota Timberwolves season preview, then dove into the Vikings and Wild talk. 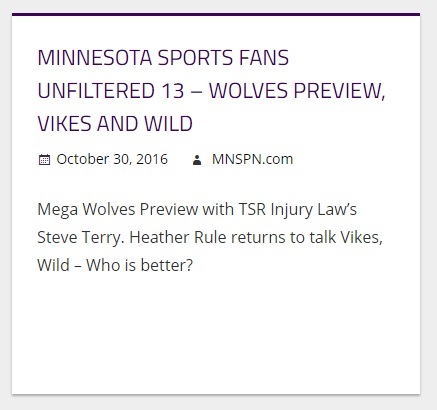 I filled in as co-host once again for the MN Sports Fans Unfiltered show with my pal Nick. We talked Wild and Gophers hoops. I joined Sam Ekstrom as a guest on his podcast on ZoneCoverage.com to talk Gophers men's hoops. I joined the guys to talk about hockey, specifically the girls' state hockey tournament. Nick and I talk about the Minnesota Gophers men's basketball team going to the NCAA Tournament, the Minnesota boys' state high school hockey tournament and, of course, the angst surrounding the Wild. I called in to talk with Nick and Lonnie about the Twins and sports dynasties. This week's topics include: the episode's namesake and SoundCloud stats (0:11-3:03), a three-part interview with freelance journalist Heather Rule (3:04-54:26), another bad week for the NFL (54:27-1:09:17) and the tweet(s) of the week (1:09:18-1:12:20). I was one of 16 guests on the season-preview podcast from Hockey Wilderness. We all made some predictions about the Minnesota Wild and offered up our hottest takes. I join the podcast at the 1:24:43 mark. I was asked to make a guest appearance on this weekly sports podcast, along with some other local sports guests. I talked about my work ventures, including my children's books, the Wild and the Twins. I join at about 1:00.20. I joined the guys again, fresh off a trip to Fort Myers, to talk about the Wild and their playoff hopes, plus a little Twins talk. I come in at about the 1:02.30 mark. Time to talk Twins and children's books with Travis.